Ollie has a booklet called “My Heart My Life” – recovering after a heart attack. Suddenly I hear a yippie – Great I have to restrict my ice cream intake to 3 times a week. Seeing as he only normally has it about 3 times a year he was delighted. Then I read – you can resume light household duties immediately – now there’s a shock to the system for him!!! My birthday. Should have been flying from Perth to Broome today for our Kimmberley & Bungle Bungle adventures. We have rearranged it for July 6th – around his birthday. I call that an extreme way of getting a birthday present! Seems we may be even more lucky than we thought. The Kimberley’s are on flood alert! Ollie hadn’t got me a card for some reason. 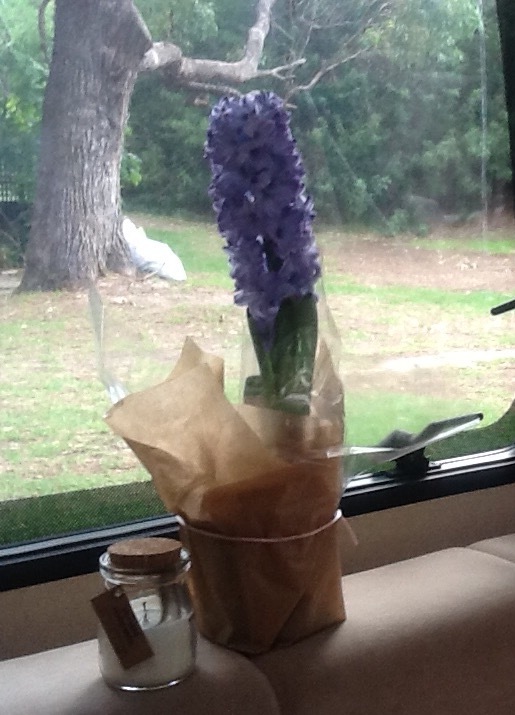 So instead of a card he bought me a hyacinth – what a great idea. Thank you everyone for all your lovely birthday wishes. It was a very busy day with messages & Facetime calls. Forgot to say – Ollie has a challenge from Chris our youngest son – Chris hopes to run the London Marathon next year and wants to get fit. So the initial challenge is 50,000 steps for Ollie & 15K a week runs for Chris. I’ll join the challenge when they’ve had some practice!!! The rain held off for the Mandurah Stretch Arts Light show this evening and we took a walk to see some of it. I did take some pics but they didn’t come out well. When we arrived we were met with a “fancy seeing you here” – it was Ine from Cedar Galleries sculpturing and her husband Bob. What a surprise. We’re now onto 15 minutes ambles. Not enough for me so I went shopping – never know what I’ll buy without restrictions !!!!!! This entry was posted in Uncategorized on May 7, 2016 by aloeliz.